File Photo: Taraba State Governor, Darius Ishaku. 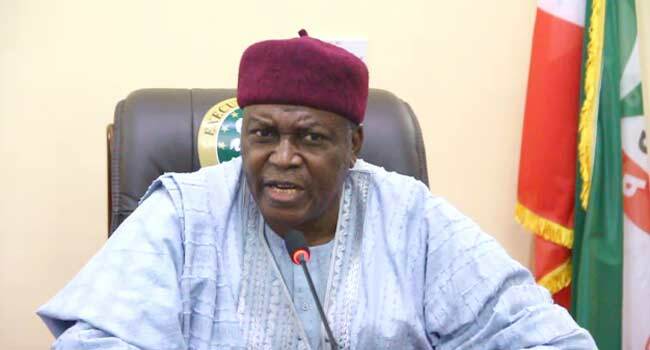 The Taraba State Governor, Darius Ishaku, has blamed the All Progressives Congress (APC) for the deaths that occurred at the campaign of President Muhammadu Buhari on Thursday. In a statement read at a news briefing on Thursday, the Senior Special Assistant on Media and Publicity to the Governor, Bala Dan Abu, accused APC leaders of hiring thugs and launching violent attacks on members and supporters of the Peoples Democratic Party. According to the statement, the thugs, who were mostly brought in from neighbouring states to create the false impression that the APC enjoys a large following in the state, came heavily armed. Abu also alleged that the governor’s convoy was attacked on its way out of the airport where Governor Ishaku, his Deputy, Engineer Haruna Manu and other senior members of government had gone to see off President Muhammadu Buhari at the end of the Presidential visit. Read the governor’s full statement below. As you are already aware, today’s Presidential campaign flag-off of the All Progressives Conference in Jalingo, Taraba State, ended on a tragic note. Thugs hired by the APC leaders in the state turned the event into an opportunity to launch violent attacks on members and supporters of the People’s Democratic Party, PDP. In the process, several lives were lost. The Deputy Governor’s car and several other cars in the convoy including that of the State Commissioner of Police and a Special Adviser to the Governor, were damaged. The thugs, most of who were imported from neighbouring states to create the false impression that APC enjoys a large following in the state, came heavily armed. They carried guns, cutlasses and sticks which they displayed openly and in the full glare of security agencies who merely looked the other way. On the eve of President Buhari’s visit, thugs hired by the APC leadership in the state had gone round Jalingo metropolis and its environs and destroyed PDP posters and bill boards. They were given cover by security agencies who fired gunshots to scare away those may dare to confront them. The Taraba State Government hereby condemns this unfortunate bloodletting that has become the character of the APC in Taraba State. Residents of Wukari are still leaking the wounds of the APC violent visitation of January 29, 2019 during which PDP posters and billboards were torn and a member of the PDP was killed. The State Government will no longer fold its arms while innocent people are being killed and maimed by the APC. Meanwhile, the APC has denied the claims, saying that the state government was playing politics with the unfortunate incident. The party claimed that “the crowd at the Jolly Nyame stadium was simply overwhelming” and the massive turnout was not anticipated, a situation which according to them, led to a stampede that resulted in the death of about five persons. The APC spokesperson in the state, Mr Aaron Artimas said: “The crowd at the Jolly Nyame stadium was simply overwhelming as no one had anticipated such a massive turnout. In the course of trying to catch a glimpse of the president, there was stampede and about five persons died. Granted that these were APC supporters, they were still citizens of this state and governor Ishaku’s subjects. “The least one would expect from a leader is to sympathize with their families rather than playing cheap politics with their deaths. If he claims the persons are PDP members, then what were they doing at the APC rally? Meanwhile, a chieftain of the party in the state, Hassan Ardo, also accused the PDP of attacking members of the APC returning home after the presidential rally in Jalingo. In a condolence message to the families of those who lost loved ones, he asked party supporters to remain calm and avoid taking laws into their hands. The Police are, however, yet to respond to the matter.